Check out the page about Goniotropis kuntzeni Development. 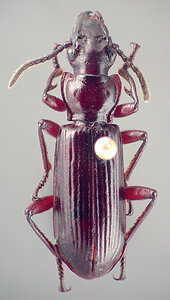 In Arizona, Goniotropis kuntzeni adults are found on mature Emory oaks in the Madrean Evergreen Woodland biotic community of the Sonoran Desert after the onset of summer rains. These habitat images are of Walker Canyon, which is located just north of the US/Mexico border in Santa Cruz Co., Arizona. 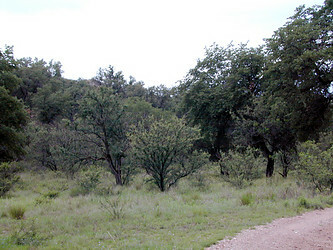 Walker Canyon contains two species of oak; Emory oak (Quercus emoryi) and the Mexican blue oak (Quercus oblongifolia), as well as species of mesquite and sycamore trees. Goniotropis kuntzeni adults are found at night, walking on the bark of the oldest Emory oak trees. 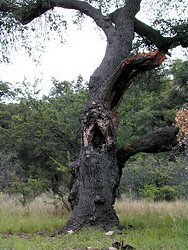 These mature trees show damage from old age and the trunks are often partly hollow. Image © 2003 Wendy Moore. 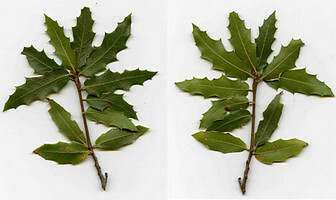 Dorsal and ventral sides of the leaves of Emory oak (Quercus emoryi). Images © 2003 Wendy Moore. Page: Tree of Life Goniotropis kuntzeni (Bänninger 1927). Authored by Wendy Moore. The TEXT of this page is licensed under the Creative Commons Attribution-NonCommercial-ShareAlike License - Version 3.0. Note that images and other media featured on this page are each governed by their own license, and they may or may not be available for reuse. Click on an image or a media link to access the media data window, which provides the relevant licensing information. For the general terms and conditions of ToL material reuse and redistribution, please see the Tree of Life Copyright Policies.